In advance of this month’s reader roundup, I put out this call: “Where do you go for pancakes?” And I wasn’t just talking about the maple-syrup’d hotstack. 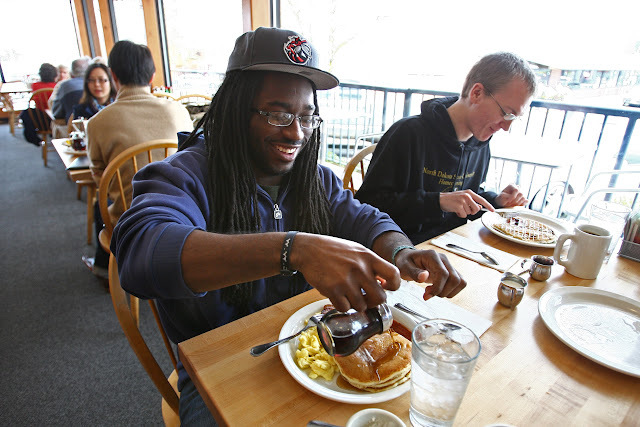 The way I see it, Greater Seattle is a veritable international house of pancakes — and I don’t mean IHOP. We also have Vietnamese banh xeo, Japanese okonomiyaki and South Indian dosas, to name a few. So I raised the flag for variations on the theme. “The text message that goes out simply says, ‘Pancakes? 9 a.m.?’ and we all know that it means meet at the Original Pancake House” the next day, said one fan of Seattle’s Crown Hill classic. “The Dutch Baby!” chimes in another regular, who says his “out-of-town food snob guests” rave about it every time. As a longtime proponent of the Original Pancake House, this food-snob agrees with the Eater who insists, “I haven’t met a pancake I didn’t like there.” My family favors the Parkplace location in Kirkland, where we always order the mile-high, cinnamon-scented apple pancake before lighting into everything from the Swedish pancakes (lingonberries? Ya, sure!) to the trademarked 49’er Flap Jacks. Newsflash! The local franchise of this national chain will soon have a Bothell sibling, slated to open in June, just north of Thrashers Corner. When I want pancakes in Edmonds, I head to the soft-tofu house Hosoonyi and order pajeon– the Korean rice-flour pancake enfolding seafood and scallions. 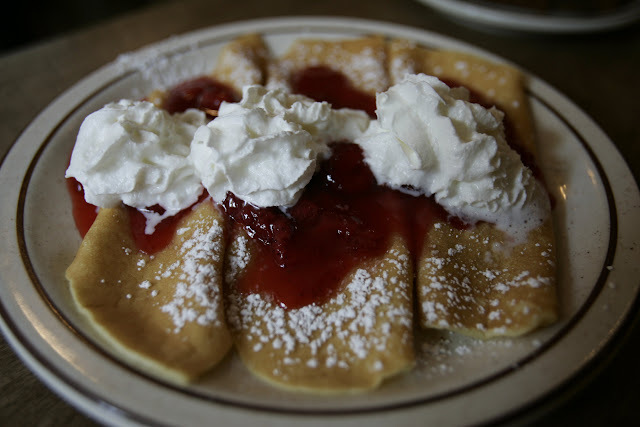 But my Eaters would rather send you to the German-accented Pancake Haus in downtown Edmonds for potato pancakes. Or to its sunnier Highway 99 competition, the Family Pancake House. Founded in 1963 by Robert Mattwig (the “Bob” behind the serviceable pancakes-and-eggs combo of the same name), the place is known for its warmhearted staffers, and it offers an extended family of pancake-centric diners with locations in Redmond, Bremerton and Port Orchard. Rest assured, however, that when it comes to pancakes, it’s not all old-skool and time-warp. To wit, the vibrant, vegan Plum Bistro on Capitol Hill is home to one Eater’s idea of pancake nirvana: banana pancakes with a chocolate mole sauce. Another suggests, “There simply is no Dutch Baby better than the one served at the Tilikum Place Cafe” near Seattle Center. But what I love about that lovely baby is it’s available both savory or sweet, at breakfast and lunch. Yes sir, that’s my Dutch Baby, served with fresh seasonal fruit at Tilikum Place Cafe. “Amazing” is the word that describes the organic pancake options at Portage Bay Cafe, with locations on Roosevelt and in South Lake Union and Ballard, say those who regularly belly up to the cafe’s toppings bar for fresh fruits, nuts and real Vermont maple syrup. And I’m with them. Care to add your take on the great pancake debate? Please do.